An interesting statistic last week... according to Nielsen Media Research, last week marked an all-time low for viewership of the big four TV networks [article on CNN]. An average of 20.8 million viewers watched NBC, CBS, ABC, and Fox, worse than the previous low of 21.5 million viewers during the last week of July, 2005. This time the long Fourth of July weekend cut into viewership and contributed to the low numbers, but it's the growing number of alternatives (cable TV, DVDs, the Net) that's the big influencer. 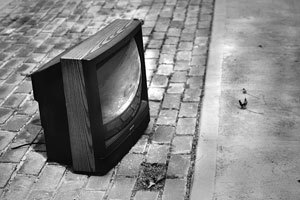 (Photo of the lonely TV by briancweed/flickr.com).